Knead with mixer dough hook for 4-5 minutes or until you have a smooth ball of dough. Rest the dough for at least 30 minutes before cutting the dough into 12 pieces (I can manage the smaller pieces in the pasta roller better). Roll the pasta sheets through a pasta roller according to the roller machine directions or watch a video. 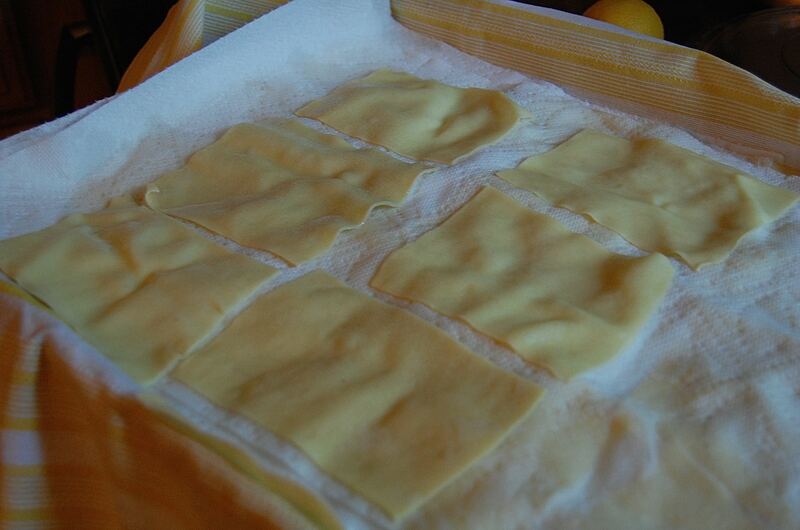 I get the dough through to the second to last setting and that is as thin as I dare roll the sheet of pasta…cut the sheets into 4 inch lengths and lay out on floured parchment paper separating each layer with another sheet of parchment cover with a towel until ready to cook. Prepare a huge pot of boiling water to cook the individual cut sheets (6-8 at a time) for about 20 seconds each, cool immediately in a bowl of ice cubes and water, scoop out and lay each one on a parchment covered sheet pan and cover with paper towels. Continue cooking the sheets and separating each layer until you can just cover the pasta with a clean soft tea towel…take a break for several hours if needed by now. I had enough pasta sheets for a 7 1/2 x 9 1/2 x 2 3/4 glass baking dish and while you can’t see all of the layers, I managed to finish with 12 or 13 layers. Each sheet wasn’t even as thick as a whiney new penny. Heat the olive oil over medium heat add the onion and carrot, briefly sauté. Add the crushed tomatoes, basil, red pepper and season with a little salt. Add wine and simmer for 30-40 minutes. 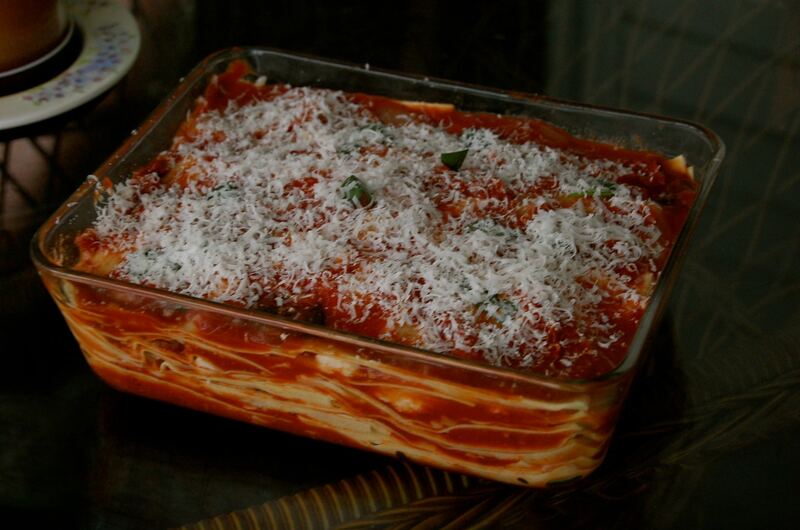 Remove from heat and cover until you are ready to assemble the lasagna.